It would be easy to fill, with photos from around the world. unique boat from Venice is loved, revered, and admired everywhere. when they discover them - often in unexpected places. and then I remember that I only have 24 hours to work with each day. So, instead, I post those little gems and curiosities here from time to time. it seems fitting to include an installment from south of the border. Thanks to my friend Drew from Tahoe Amore for this surprise in Ensenada. loves the gondola on his roof! 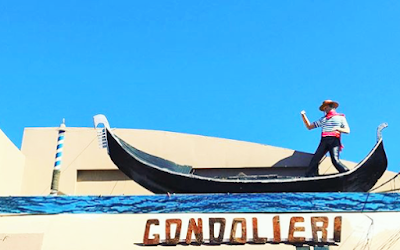 I discovered that the gondolier who stands up there used to have an oar. My money is on hurricane or drunken fraternity jocks during Spring Break. Whatever the case, happy Cinco de Mayo, amigos!